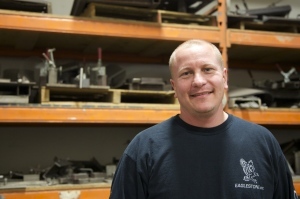 A team player in the office and on the field, John Blomquist earned his Bachelor’s Degree in Marketing and Industrial Design at Southern Illinois University – Carbondale before joining the Eaglestone team. As a member of Eaglestone’s dynamic engineering team, John often uses his experience in Product Development to develop innovate new equipment. When he’s not working on new designs, John enjoys the great outdoors with his family. Whether he’s playing football or waterskiing, he likes to stay active and spend time with those that he loves. His time off the field is spent watching “Breaking Bad” and discussing Walter White’s latest schemes.